It is good practice to keep your garage door maintained and in good working order. This helps prevent any unforeseen problems, and keeps your doors in good condition year round. Below are some maintenance tips to keeping your garage doors properly maintained. A really easy thing you can do every month, or schedule a service with a garage door company, is lubricating your garage doors. Lubrication helps keep your doors working perfectly year round. Regular lubrication at minimum should happen 3-4 times a year. Make sure to use a lubricant that isn’t greasy or sticky. If it’s sticky, it can collect dirt, dust, hair, etc that will then turn into black paste around your working parts. This is gross, hard to clean and isn’t great for your doors. We use silicone based lubricants and these work great! You can pick up a bottle at your local hardware store. Make sure to get the hinges, tracks, springs, rollers, and locks. Rust is also an enemy of your garage door, and is important to check for during a routine maintenance check. Rust can collect around your springs, and break them. No matter what kind of spring system you have, extension, torsion, etc. maintaining your springs system is important for your overall garage door health. Every spring, and more frequently if possible, is a great time to clean your garage door as well. Wipe down the tracks, get rid of cobwebs, hose down the door itself. All of these small things will keep your garage door in good shape! Garage door maintenance done properly can ensure you stay on top of any potential problems. The last thing you want to do is have to make an emergency call to a garage door repair company because your garage doors failed you. If this does happen, call Perfect Solutions! 281-557-6351. In today’s world, homeowners are always looking for ways to make their home “green” and more eco-friendly. Even better, when these “green” upgrades also save money. This post will look at some of the ways any homeowner can save money on energy and make their garage more environmentally friendly. Wood and steel are the most durable garage door material options you can choose. They do well in a variety of temperatures. There are also a wide range of wood and steel garage doors to choose from. They come in all sizes and styles. If you have a specific budget, have no fear. Since there are so many options on the market, finding a door in your price range isn’t too difficult. A door made of composite material is also an option, budget-friendly and great for the environment since they are made with recycled materials. Insulation is a really easy and inexpensive way to go green and save money. It can save you a lot of money long term since the insulation regulates the temperature and helps keep the interior of your home hot or cold depending on the season. There are also options to have a perforated garage door, which is great for warm climates, which allows more light and ventilation without compromising security or privacy. An easy monthly maintenance task is to check your garage door weatherstripping for any cracks or tears. If you find any, replace them ASAP! The air in your garage will go to those cracks and counteract the insulation. You can replace your weather stripping as a quick weekend DIY project, or give us a call and we can do it for you! Some homes have HVAC vents going into their garage. If this is the case for you, consider insulating the walls around your garage. Insulatoin and drywall will add a protective layer that will help to reduce your heating and cooling costs. 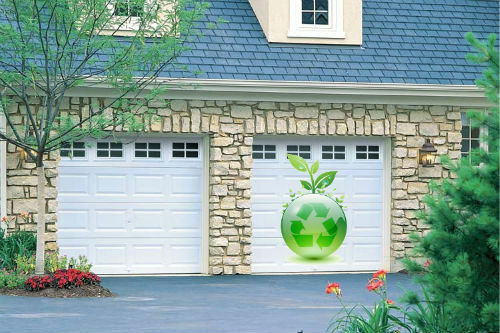 If you are already looking to purchase a new garage door or want to make some eco-friendly changes to your home, the 4 tips above are a great way to start. Look at doors that are made from recycled material, and invest some money in insulating your garage door and walls around it. Garage doors need some basic maintenance to make sure they stay safe and perform as they are supposed to. There are a ton of working parts that need to be kept to a certain standard. It’s easy to do your own basic DIY for your garage door. Hiring a professional is a hassle-free way to get it done yearly as well! If you are on the DIY side of things, read this post with the 5 basic things you can do every year to keep your garage door functioning well. 1. Perform a basic visual inspection. If you do this on a regular basis, you’ll notice anything you don’t remember seeing the last time. Just look around and note any wear and tear. Check the garage door tracks, springs, pulleys, cables, and rollers. Are there any frayed cables? Is everything working as you think it should? You can also take a look at the mounting hardware, like the hinges and screws and make sure they are secured. We would recommend a monthly visual inspection, or at least every quarter. While you are performing your visual inspection, take a damp towel and wipe down the tracks. This helps to remove any debris or built up dirt that can wedge itself in between the metal tracking. We recommend lubricating your working metal parts about twice a year. You can buy a silicone based spray lubricant at your local hardware store or on Amazon. Spray a small amount on the tracks, hinges and rollers. This helps prevent future damage and ensures your garage door will slide smoothly on the tracks. Any door manufactured after 1993 will have an auto-reversing feature that prevents anything from being pinned down by your garage door. You should do this at least once a year. A great way to test the feature is putting a rolled up newspaper in the path of the garage door (where it closes). The sensor you have installed should detect the paper and automatically reverse. If it doesn’t, call a professional immediately! You can do this once a month and it takes 5 minutes. Disconnect your garage door opener if you have one. Manually lift the door and check that it glides smoothly with no resistance. Once you lift the door, it should stay open. If it doesn’t stay open or it’s hard to open manually, your door is probably not balanced. Best to call a garage door tech to re-balance it for you. DIY garage door maintenance isn’t that hard and takes a few minutes every month. Safety precautions to take include being aware of what you are doing, making sure everyone at your house knows you are working on the door and stays away for safety and you have a garage door company on speed dial in case something goes wrong! If you notice any major issues with your garage doors or need a maintenance call, and you live anywhere in the Sugar Land, Missouri City, Pearland, The Woodlands, Pasadena, Richmond, Texas area, please call Perfect Solutions Garage Door for a free quote! When thinking about your home security, you might not think about your garage door being a common entry point for criminals. Commonly we think of windows, front and side doors. If you don’t have a proper security system in place, your garage door is actually a very common point of entry for burglars. This post will go over some necessary steps you can take to keep your home and your garage door secure. Most garage door openers on the market now have rolling-code technology, as well as fingerprint recognition. Both of these features make it really difficult for criminals to open your garage door. If you call Perfect Solutions Houston, we are happy to give you a quote on any opener that has these features! If you have an attached garage, you most likely have a door connecting your home to your garage. Usually when you leave the house, you leave this door open. Why lock it if it’s in your garage, right? Makes for easier access when you are going and coming. But it should be kept locked, especially when you are away. You should also consider installing a peep-hole and a deadbolt on this interior door, just like the exterior doors to your home. Duh, right? A lot of homeowners however leave their garage doors open during the day while they are home. While a criminal might not walk up and steal something in broad daylight or when you are home, but they will get a good look and what you have inside that would be nice to steal when you are away. A common safety hazard is having your garage door opener inside your car. If someone breaks into your car and takes the remote, they can use it to break into your garage and home. A key chain remote stays with you, not your car, which is better security. A quick homeowner weekend project is to buy and install outdoor motion sensor lights around your property. The best places are around your garage. These lights help keep your home safe since intruders don’t enjoy being in the spotlight! By investing in a better, updated garage door opener, locking your doors, keeping your garage closed, using a key chain opener and installing motion sensor lights – you can make great strides in improving the safety and security of your garage door, and your home!